^ ORA I, v. 39/1, p. 402. The start date is formal; it is the day the landing force went aboard their transports. The first day of contact between opposing forces was August 4. ^ Sometimes spelled Dauphine in contemporary accounts. ^ Grant Pass in present-day nomenclature. ^ Wise, Lifeline of the Confederacy, p. 20. Kinney, Battles and leaders, v. 4, p. 384, map. ^ Luraghi, History of the Confederate Navy, p. 187. ORA I, v. 6, pp. 398, 826, 835. ^ The only other remaining port was St. Marks, Florida, which was too small for most steamships, and furthermore lacked rail connections with the interior. See Wise, Lifeline of the Confederacy, pp. 80–81. ^ Wise, Lifeline of the Confederacy, pp, 168–180; appendices 11–14. ^ Scharf, History of the Confederate States Navy, pp. 537–549. ^ Scharf, History of the Confederate States Navy, pp. 790–791. ^ Friend, West wind, flood tide, p. 51. Kinney, Battles and leaders, v. 4, p. 385. ^ ORN I, v. 21, p. 528. The piles also thwarted early CS Navy plans for cooperation between the defenses of Mobile and New Orleans. See Still, Iron afloat, p. 189. ^ Faust, Encyclopedia of the Civil War, entry for Fort Morgan. ^ ORA I, v. 39/1, pp. 419–420. ^ Maury's report, ORA I, v. 39/1, p. 417. Canby asserted in his report (ORA I, v. 39/1, p. 403) that 818 enlisted men and 46 officers were captured with the surrender of Fort Gaines; this number is quoted by Friend, West wind, flood tide, p. 156. The discrepancy may be caused by the failure of Maury to include in his accounting reinforcements he rushed to the fort when he thought that the invaders could be repulsed (ORA I, v. 39/1, p. 417). On the other hand, all such numbers in the Civil War are unreliable. ^ ORA I, v. 39/1, p. 441. ^ Friend, West wind, flood tide, pp. 74–75, 120–122. ORA I, v. 39/1, pp. 410, 411. ^ Friend, West wind, flood tide, pp. 57–58. ORN I, v. 21, p. 364. ORA I, v. 39/1, p. 414. ^ Friend, West wind, flood tide, pp. 137–139. ORA I, v. 39/1, p. 433. ^ Friend, West wind, flood tide, pp. 67, 125. ORN I, v. 21, p. 373. ^ Opposing forces (Confederate), Battles and leaders, v. 4, p. 400. ^ Johnston, Battles and leaders, v. 4, p. 401. But see Still, Iron afloat, p. 196. ^ Still, Iron afloat,, p. 190. Another tie between Tennessee and Virginia is that Chief Naval Constructor John L. Porter was active in the design of each. This is not surprising, as most Confederate ironclads were prepared from Porter's basic designs. See Still, p. 94. ^ Still, Iron afloat, p. 202. ^ Early in the war, Alabama had acquired steamer Baltic and converted her into an ironclad ram, to serve in and near Mobile Bay. She was never effective, however, and her armor was removed to be used on another vessel, CSS Nashville: Still, Iron afloat, pp. 80–81, 192. ^ Cahore, Naval campaigns of the Civil War, p. 187. ^ Still, Iron afloat, pp. 190–196. ^ Battles and leaders, v. 2, p. 74. ^ Tucker, Blue and gray navies, p. 37. ^ Friend, West wind, flood tide, p. 76. ORN I, v. 21, pp. 380, 388. ^ Friend, West wind, flood tide, p. 76. Kinney, Battles and leaders, v. 4, p. 381. ^ ORN I, v. 21, p. 416. 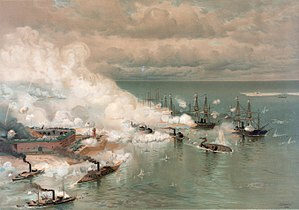 ^ Farragut had tried to pass the Confederate works at Port Hudson on March 14, 1863, in support of the Vicksburg campaign. Although only two of his seven ships got through, the attempt was regarded as a success. See Anderson, By sea and by river, p. 145. ^ Friend, West wind, flood tide, p. 154. ORN I, v. 21, pp. 416–417. ^ ORN I, v. 21, p. 403. ^ Calore, Naval campaigns of the Civil War, p. 189. ^ Friend, West wind, flood tide, p. 166. ORN I, v. 21, p. 415–418. ^ Friend, West wind, flood tide, p. 168. ORN I, v. 21, p. 418. The disposition of the Confederate ships was in what would come to be known as "crossing the T."
^ In an early account of the battle, Rear Admiral Foxhall A. Parker speculated that the poor steering of his monitor forced Craven's hand; see Friend, West wind, flood tide, p. 178. ^ Duffy, Lincoln's admiral, pp. 240–248. ^ Anderson, By sea and by river, pp. 242–243. ^ ORN I, v. 21, p. 418. ^ Friend, West wind, flood tide, p. 219–221. ORN I, v. 21, p. 419. ^ Friend, West wind, flood tide, pp. 228–229. ORA I, v. 39/1, p. 436. ^ ORA I, v. 39/1, p. 410. ^ Friend, West wind, flood tide, p. 236. ORA I, v. 39/1, pp. 417–418. ^ Friend, West wind, flood tide, p. 239. ORA I, v. 39/1, pp. 411–414. ^ Page, Battles and leaders, v. 4, pp. 408–410. Friend, West wind, flood tide, pp. 239–240. ^ Duffy, Lincoln's admiral, p. 243. ^ Watson, Battles and leaders, v. 4, p. 407. ^ Anderson, By sea and by river,, p. 242. ^ "鐘4打"は機関室に全速を要求する合図である. Friend, West wind, flood tide, p. 187. 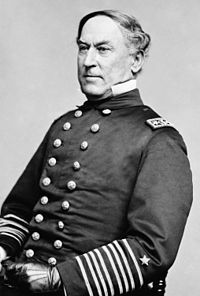 ^ Duffy, Lincoln's admiral, pp. 247–248. ^ Friend, West wind, flood tide, pp. 124, 178. ORN I, v. 21, p. 525. ^ Kinney, Battles and leaders, v. 4, pp. 379–400. Friend, West wind, flood tide, pp. 123–124, 170, 217–218. ^ ORN I, v. 21, p. 518. ^ Friend, West wind, flood tide, p. 251. ORA I, v. 39/1, p. 405. ^ Musicant, Divided waters, p. 324. ^ ORA I, v. 39/1, p. 404. ^ Page, Battles and leaders, v. 4, p. 410. ^ ORA I, v. 39/1, p. 428. ^ McPherson, Battle cry of freedom, p. 775. ^ Faust, Encyclopedia of the Civil War, entry "Mobile, Siege of."